Beautifully updated 2/2 Palm Lakes waterfront unit. Mr. & Mrs. CLEAN live here! From the minute you enter your foyer, you will notice the light tile floors which reflects the natural light. Your gourmet kitchen will impress you w/ newer appliances, gorgeous cabinets, pretty granite countertops, nice back splash! Extra cabinets added for storage. Dining room has convenient pass thru to kitchen. Spacious living room opens to your balcony. Relax in your cheery, large master suite with 24'' tiling and walk-in closet. Master bath has updated vanity. Guest will love to visit and stay in the spacious guest room. Versatile balcony can be enclosed or open to enjoy the easterly breezes. Balcony laminate newly installed. Pet friendly building allows up to 2 pets. Washer and dryer in the unit. Hillcrest: Remodeled Penthouse with new wood floors and amazing views. Feel like you are in top of the world ,Best price for a penthouse convertible 2/2 with high ceilings in established over 55 building. Great views of new park/lake areas overlooking new Parkview at Hillcrest development. Lots of closet space in large master bedroom. Bathrooms have been remodeled with top of the line materials. Freshly painted. Steps from laundry and elevator. Minutes from downtown restaurants and shopping, beaches and airport. 2+ cars OK. Easy to show - see show assist. Imperial Towers: SPACIOUS & CLAEN 1 BEDROOM 1.5 PENTHOUSE UNIT ON QUIET SIDE OF BLDG. UNOBSTRUCTED VIEW OF INTRACOASTAL FROM BALCONY. TILED THROUGH OUT - ASSESSMENT PAID - RELAXING & HEATED POOL LOCATED AT INTRACOASTAL. RIGHT ACROSS THE STREET FROM HALLANDALE BEACH, MINUTES AWAY FROM HOLLYWOOD BEACH. ALL OFFERS WILL BE CONSIDERED. BUILDING HAS BEEN UNDERGOING REFURBISHING INTERIOR & EXTERIOR. PERFECT FOR INVESTORS SINCE THIS UNIT IS RENTED UNTIL MAY 2019 (TENANT ALREADY 5 YEARS IN THE UNIT MARKET PRICE TO RENT TODAY $1350) NO RENT 1ST YEAR! Cypress Bend: Penthouse unit with canal view located in the friendly community of Cypress Bend. Eat in kitchen, large master bedroom, walk-in closets, laundry room inside unit, lots of amenities including club house, pool tables, pool, basketball, shuffle board, tennis courts & more. Located close to restaurants, shops, beach and casino. Small pets are allowed, 670 minimum credit, no lease first 2 years of ownership. Property is sold "AS-IS", no warranties, repairs, disclosures. Seller and Listing Agent have no knowledge of property history. Information is not guaranteed, BUYER is responsible for verifying all info prior to closing. Island Club: WATER VIEWS FROM ALL WINDOWS OF THIS LOVELY 2 BEDROOM, 1.5 BATH PENTHOUSE CONDO IN MAGNIFICENT ISLAND CLUB CONDO COMMUNITY. RIGHT ON FEDERAL HIGHWAY IN THE HEART OF EVERYTHING WITH 24 HOUR MANNED SECURITY & MEDECO KEY ENTRY INTO HIGHRISE BUILDING WHICH IS LOCATED IN THE CENTER OF THE COMMUNITY. CONDO IS IMMACULATELY MAINTAINED AND CURRENTLY TENANT OCCUPIED WITH A TENANT THAT COULD STAY OR DEPART AT END OF LEASE IN MAY. ROYAL PALM BLDG IS CURRENTLY BEING PAINTED TO OFFER A MORE MODERN LOOK. RENDERING IS ATTACHED TO SHOW HOW BUILDING WILL LOOK WHEN COMPLETE. GREAT MANAGEMENT, BUILDING FINANCIALS & LOW MAINTENANCE FEE. ISLAND CLUB OFFERS MANY AMENITIES TO INCLUDE TWO POOLS, TIKI BARS, BBQ'S, FITNESS ROOM, BILLIARD ROOM, RECREATION ROOM, COURTESY BUS TO LOCAL STORES/BANKS & SO MUCH MORE. Gallery One: Penthouse unit! Amazing location walking distance to the beach and Galleria mall with fine dining, close to Publix. Modern fully furnished 1 bedroom, 1 bathroom unit can be used as a year round home, managed by Hilton, owner or property manager. Oversize balcony with entrance from living room and bedroom, owner's closet, cooktop, microwave, fridge, dishwasher inside the unit. Unit is bigger compared to majority of 1 bedroom units in the building. Investment opportunity in Fort Lauderdale, perfect for out of state owners. Building directly on the Intracoastal has all the amenities including pool, fitness, conference rooms, Starbucks in lobby, bars, restaurant. Bayview school district! Maintenance fee includes also electric, internet, cable TV. Hollywood: PENTHOUSE at the Hollywood Beach Resort! This bldg is on the Ocean & Broadwalk with shops, dining, New Association is already working to bring it back. This really over sized 1 bedroom, 1.5 bath penthouse unit is newly redone. All new baths, kitchen & furniture. Features gorgeous expansive direct ocean views from every window! Condo has no rental restriction, you can use the Hotel program for income & also use as your own weekend place for a quick getaway! Private elevator to PH floor. Maintenance includes ALL utilities: Electric, cable, water, garage parking, a/c, pool, security, insurance. Hollywood: Bldg is directly on Broad-walk. Parking garage, impact windows, painting, exterior work, huge pool. This 1bd/1bth PH unit w/great ocean views is updated, new everything, bath, kitchen, furnishing & tile! Enjoy boardwalk, shop, dine, pool steps from ocean. Condo has no rental restrictions; use the Hotel Program for income, online rental sites and/or use it for your own weekend place or for a quick getaway! Maintenance includes ALL utilities: water, electric, parking garage, insurance, pool, cable, a/c, security. Lots of small projects being done in the building by recently elected Board of Directors. Hollywood: This bldg has Impact windows, painting, ext work + beautiful pool. This 1 br/1 bath PH unit w/ICV+City views is updated w/new everything! New bath, kitchen, furnishing and tile. Fabulous!! Stroll the boardwalk, shops, dining & use our pool by the ocean. Nothing else like this 1! Condo has great flexibility w/renting as you can do AirBnB or use the Hotel Program for income + use it for your own weekend place or for a quick getaway. Separate elevator to PH floor. Maintenance includes ALL utilities: Water, pool service, insurance, security, electric, parking garage, a/c. Imperial Towers: Penthouse living at its finest in this 1 bedroom 1.5 Bath unit at Imperial Towers North.This unit boasts High Impact Windows and doors, remodeled Kitchen and Bathrooms and a wonderful view of the Intracoastal. This building is completely secure, renovated lobby, great amenities which highlight and pool on the intracoastal. The building has an amazing club room with a view of the water, library, bike room storage, and a gym. You are steps to the beach and walking distance to all the shopping and dinning. 5 minutes to Hollywoods Margaritaville and Aventura mall. Close access to transportation and the airport. This is a must see! Do not Miss Out! Gallery One: Own a Penthouse Suite at the GALLERYone DoubleTree Hotel next door to the Galleria Mall! This turnkey modern one bedroom PENTHOUSE residence features Stunning Intracoastal and Ocean Views. Watch the stunning yachts of Fort Lauderdale pass by from the outdoor balcony with sweeping views of the ocean and the city. Step inside to find a new pull out sofa in the living room, four person dining table, kitchen with full size microwave and dishwasher along with an owners closet to keep you personal items locked and ready anytime you arrive to enjoy the suite life. Amenities include Starbucks, breakfast bar, restaurant, indoor and outdoor bar, waterfront pool, water taxi pickup on property dock, gym, and one valet parking space. Hollywood: The ONLY penthouse w/a BALCONY at the Hollywood Beach Resort. Owner will entertain any reasonable offer. Unit has been remodeled, a lot of improvements done. New everything! Really over-sized 1 bedroom & 1.5 bth penthouse. New baths, granite kitchen & furniture. Features gorgeous expansive direct ocean views from every window. No rental restrictions, rent on your own, use the hotel program for income or also use as your own weekend place for quick getaway! Private elevator to PH floor. All utilities included in maintenance: water, electric, insurance, cable, parking garage, A/C, pool, security. Opal Towers: Tenth floor penthouse with amazing aqua blue oceanfront views on Hillsboro Mile.1 bedroom, 1-1/2 baths, completely renovated kitchen and baths, granite counter tops, stainless appliances, washer/dryer in unit, crown molding, rare deeded underground garage parking, 24 hr security and concierge. Take the elevator down to the Olympic size heated pool. Private beach access with lounges and barbecues. Includes complete gym and party room for 100 plus guests. WATER & INTERNET WIFI INCL in MAINT FEE! Service America Home Warranty Available. Seller Financing Available. Solid association-no foreclosures here. Owners and tenants properly screened so you can feel confident about your neighbors. Oceanfront penthouse that's move in ready for this price is rare! Don't miss opportunity! Delphi Towers: Breathtaking ocean and city views, all amenities. 1 bedroom right across the street from the private beach. Aristocrat: Penthouse apartment with great southeast views of the Ocean and Intracoastal Waterway. One block to the beach. Parking space #44. Recently painted; impact windows. Washer/Dryer on each floor. Close to shopping & restaurants. Intracoastal Water Taxi at nearby Indian Mound Park. Amenities: Heated Pool; Clubhouse; Exercise Room; Rec Room. Icemaker does not work. No renting first two years. Tradewinds: Beautiful light & bright penthouse condo w/large balcony on the coast of Pompano Beach! 2 Bedrooms, 2 bathrooms in a nicely remodeled boutique building. Amenities include pool, tennis, community room, shuffleboard, laundry areas & more! Excellent location close to dining, shopping and highways! Steps to the beach! Leslie: Penthouse unit with spectacular panoramic view of the sunset and water! Completely renovated throughout &offered fully furnished. Floor to ceiling windows in every room provide a ton of natural sunlight.The kitchen flows into the living room & features a breakfast bar, granite countertops, instant hot water, new A/C, double oven, stainless steel appliances and custom cabinetry with a LOT of storage space. Great layout with a second bedroom/office with a build in Murphy bed. Hardwood floor throughout. Both bathrooms have been updated; master bath has separate tub & shower with dual sinks. Soundproof walls! Hurricane shutters, UNDER COVER parking AND great amenities:valet parking, a pool, tennis court, & a gym. Pets under 20 lb OK. The beach just a short bike ride away! 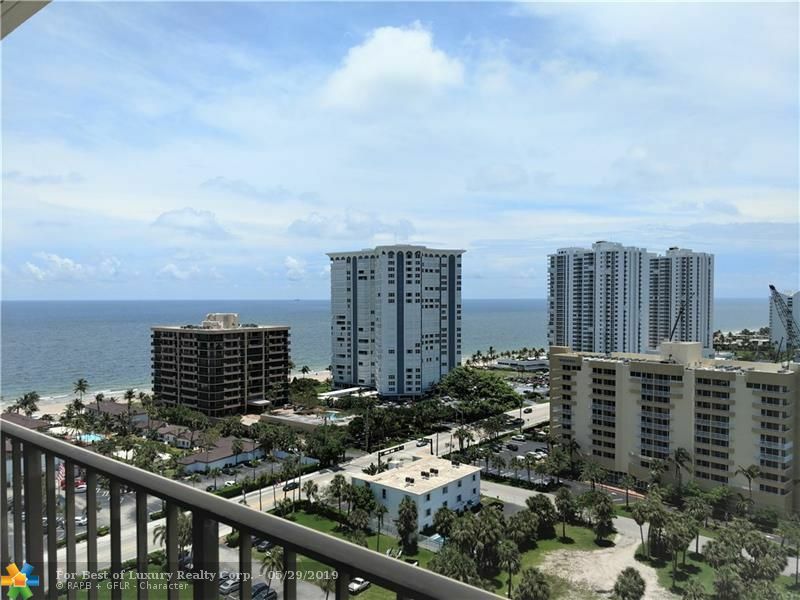 Lake Point Tower: Great PH apartment in the Hallandale Beach area.Enjoy magnificent views from breakfast area and screened-in balcony, with access from living room and both bedrooms. Kitchen and bathrooms tastefully remodeled. Stainless steel appliances,wood cabinets and granite counter tops and breakfast dinning. Tons of storage. Complex features gym, sauna, party room w/ kitchen, guarded gate w/security camera, pool, barbecue,car wash area, bike storage and boat dock as available. Neighborhood free bus service. Walking distance to the beach. Close to Gulfstream Park, Aventura Mall, and lots of shopping in Hallandale Beach Blvd.